I recently installed Mozilla’s Collusion add-on for Firefox. 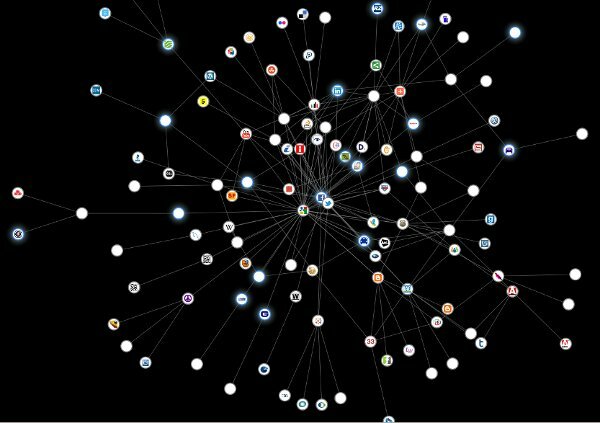 It maps out the set of information-sharing relationships between sites as you visit them and they install various 3rd-party-cookies to track your browsing history. 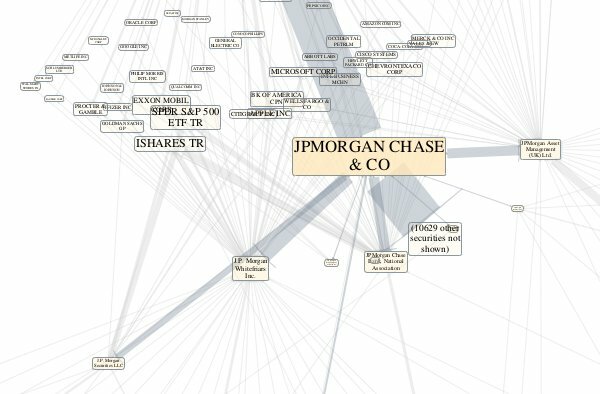 Has a neat interactive network viz as a browser plugin where so you can highlight sites you’ve visit and who they reported to. This image was after a week of low-intensity computer use. Not that surprising to see Google, Facebook and Twitter as very central nodes, tho still impressive to have an image of how many sites report to them. Some sites like quantserve.com I’d at least heard of before, but not some of the other central stats players like 2o7.net or media6degrees.com or imrworldwide.com that appeared lurking in the network. The visualization seems to be built in SVG using the D3 library’s network code. The interactivity and design are quite lovely, at least for small networks. However, now that I’ve been running Collusion for a month, the graph is quite large and the animation is getting painfully slow and eating my CPU.